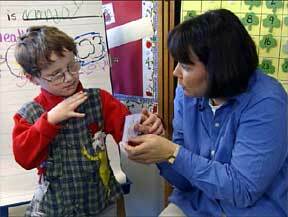 For children with deafblindness, one of the most critical areas related to learning is concept development. Concept development is sometimes confused with skill development. A concept is a mental representation, image or idea of tangible and concrete objects (e.g., a chair, a dog) and intangible ideas and feelings (e.g., colors, emotions). A skill is that ability to do something (e.g., tying a shoe, using vision to find an object). Concepts can be divided into three groups. Concrete concepts: relate to objects or things that are tangible (e.g., a car, a chair). Semi-concrete concepts: relate to an action, color, position, or something that can be demonstrated but not held in one’s hand (e.g., jumping, behind, red). Abstract concepts: include feelings (e.g., love, nervousness). Sighted and hearing children receive a constant flow of visual and auditory information which facilitates the development of concepts. For children with combined vision and hearing loss, the flow of information is incomplete. Concepts don’t develop naturally or easily. Alternate strategies must be used to teach these children concept development. Objects exist: children with deafblindness have difficulty learning about the existence of objects because they can not see or hear objects clearly. Objects have permanence: children with combined vision and hearing loss can’t observe objects and people at a distance and know that things exist beyond their fingertips. Objects differ: children with deafblindness won’t know that one object is different form another unless they can touch and explore them. Objects have names or labels: children with both a hearing and vision loss need to use touch to support language learning. Objects have characteristics: children with deafblindness will have difficulty identifying the different characteristics of objects because of the lack of access to information about those objects. Objects have functions or use: children with combined vision and hearing loss can’t observe how objects are used, or hear the sounds associated with the functions of objects. Generalize the concepts to a variety of situations.